"Who is Theory Hazit? One man (Thearthur Washington) born in Kentucky and currently living in Cincinnati, Ohio. A style addict on the microphone who also has a knack for making fresh beats. Theory Hazit is a dynamic song writer who knows how to make music that is entertaining, thought provoking and unpredictable. The album Extra Credit offers a wide range of material from raw rhymes, soulful r&b flavor and much more." Among his influences, Theory cites Redman and Ice Cube. Two rappers you wouldn't necessarily think of in the same setting (other than their regrettable choices in acting roles, perhaps), but its clear after listening to a few of Theory's songs that they have both had an impact on his style of rapping. Though he never approaches the over-the-top aggressiveness of Cube, his rhymes feature a good dose of social commentary, something that Ice Cube used to do quite well before he went Hollywood on us. Yet, like his other influence Reggie Noble, he mixes in some humor to keep things from getting too heavy. The end result is an album that sounds quite good, and it reminds me of the stuff that was coming out in the early 90's from groups like De La Soul and A Tribe Called Quest. 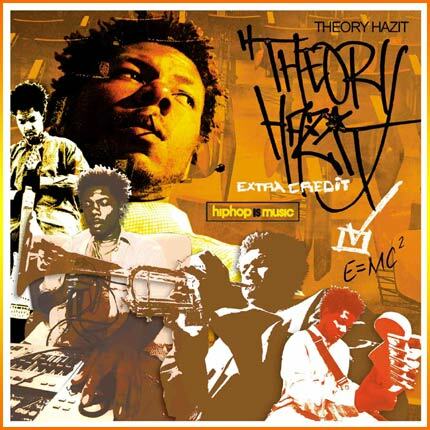 Theory's album, Extra Credit, is due out in May. You can find more about the album over at his label's website, Hip Hop Is Music. To hear more of Theory Hazit's music, hit up his MySpace page.